(Nanowerk News) Trying to understand the complex workings of a biological cell by teasing out the function of every molecule within it is a daunting task. But by making synthetic cells that include just a few chemical processes, researchers can study cellular machinery one manageable piece at a time. A new paper ("Synthetic Protocells to Mimic and Test Cell Function") from researchers at Yale University and the National Institute of Standards and Technology (NIST) describes a highly simplified model cell that not only sheds light on the way certain real cells generate electric voltages, but also acts as a tiny battery that could offer a practical alternative to conventional solid-state energy-generating devices. 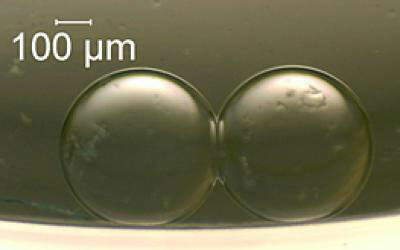 Each synthetic cell built by NIST engineer David LaVan and his colleagues has a droplet of a water-based solution containing a salt—potassium and chloride ions—enclosed within a wall made of a lipid, a molecule with one end that is attracted to water molecules while the other end repels them. When two of these "cells" come into contact, the water-repelling lipid ends that form their outsides touch, creating a stable double bilayer that separates the two cells' interiors, just as actual cell membranes do. If the researchers only did that much, nothing interesting would happen, but they also inserted into the bilayer a modified form of a protein, alpha-hemolysin, made by the bacterium Staphylococcus aureus. These embedded proteins create pores that act as channels for ions, mimicking the pores in a biological cell. "This preferentially allows either positive or negative ions to pass through the bilayer and creates a voltage across it," LaVan says. "We can harness this voltage to generate electric current." If the solutions in the two cells start with different salt concentrations, then poking thin metal electrodes into the droplets creates a small battery: electrons will flow through a circuit connected to the electrodes, counterbalancing the ion flow through the channels. As this happens, the ion concentrations in the droplets eventually equalize as the system discharges its electric potential. Building synthetic versions of complex real cells—such as those that enable an electric eel to zap its prey—is far too difficult a task for now, says LaVan. So the researchers instead created this far simpler system whose performance they could understand in terms a handful of basic properties, including the size of the droplets, the concentration of the aqueous solutions, and the number of ion channels in the barrier between the two cells. A tiny battery with two droplets, each containing just 200 nanoliters of solution, could deliver electricity for almost 10 minutes. A bigger system, with a total volume of almost 11 microliters, lasted more than four hours. In terms of the energy it can deliver for a given volume, the biological battery is only about one-twentieth as effective as a conventional lead-acid battery. But in its ability to convert chemical into electrical energy, the synthetic cell has an efficiency of about 10 per cent, which compares well with solid-state devices that generate electricity from heat, light, or mechanical stress—so that synthetic cells may one day take their place in the nanotechnology toolbox.